After being woken a tad early this morning by my puking dog, I felt that I might as well use my time to finish my next blog post! In any case, I might have lied. I said the pumpkin hand-pies were the last “pumpkin” recipe for a while, and technically they were the last one that used the pumpkin puree itself. 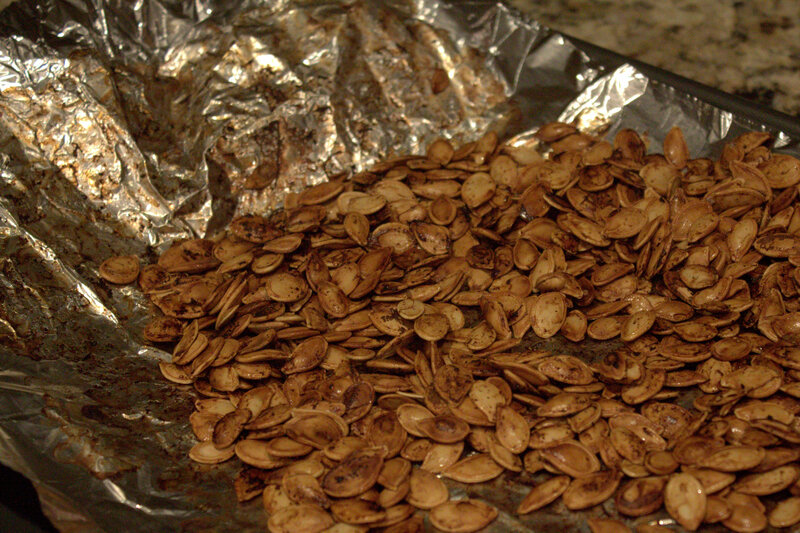 HOWEVER, these pumpkin seeds were also a product of the pumpkin roasting expedition. I’m a firm believer that no pumpkin seed should ever go to waste. What a shame to roast and harvest a whole pumpkin and then just discard the delicious seeds that pumpkin worked so hard to produce. This is a new recipe that I made for the first time this year, compliments of my future sister-in-law. 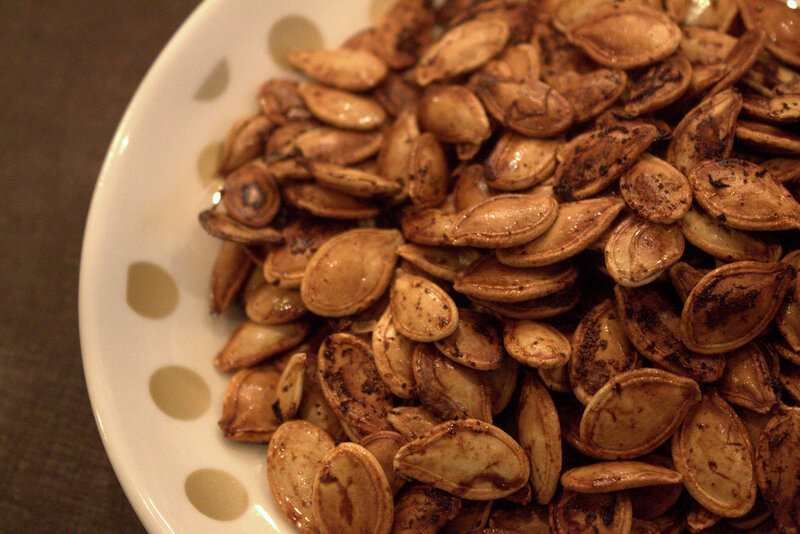 I’ve made plain salty toasted pumpkin seeds before, and I’ve always enjoyed them, but the little extras on these seeds – some Worcestershire sauce and garlic powder, made them WAY better. 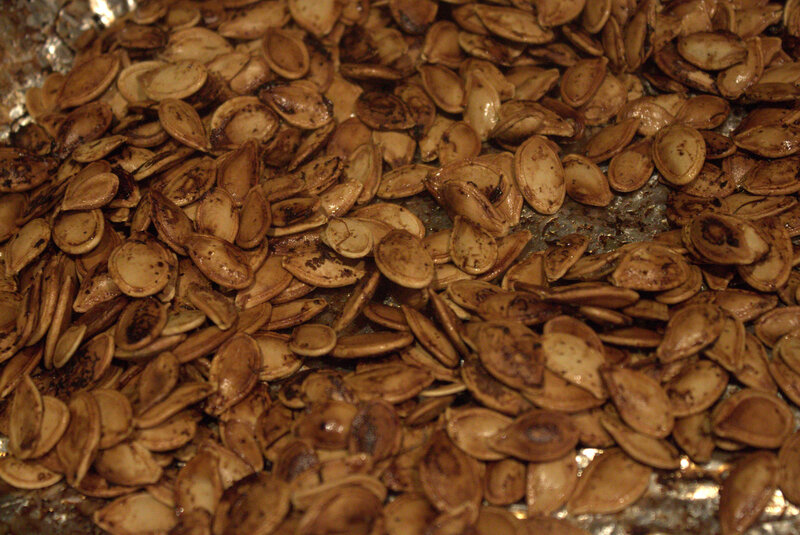 The cumbersome part of making pumpkin seeds is definitely cleaning them off. I like to start by dumping all the pumpkin guts in a big bowl. 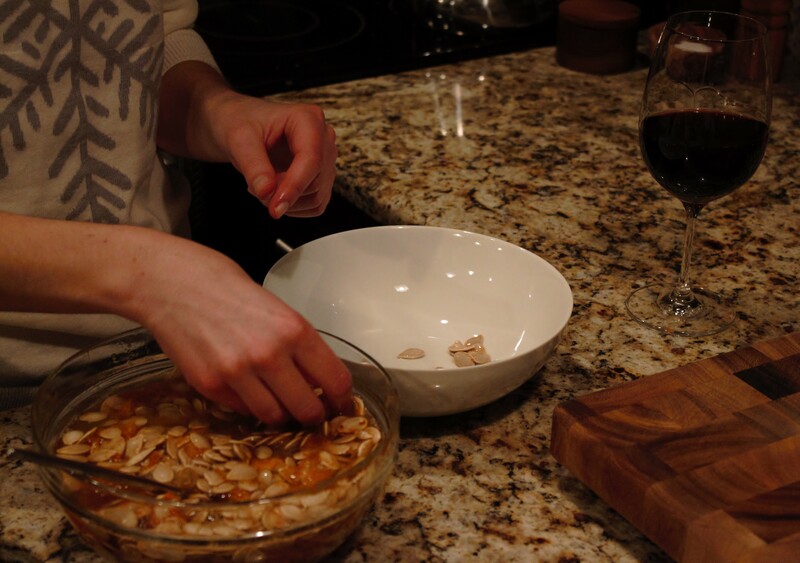 Then I fill the bowl with water and use my hands to rinse off and pull out the seeds, leaving the gunk behind. Feel free to let me know if you’ve found a better way. Obviously I find this process so irritating that I require a glass of wine to get through it. 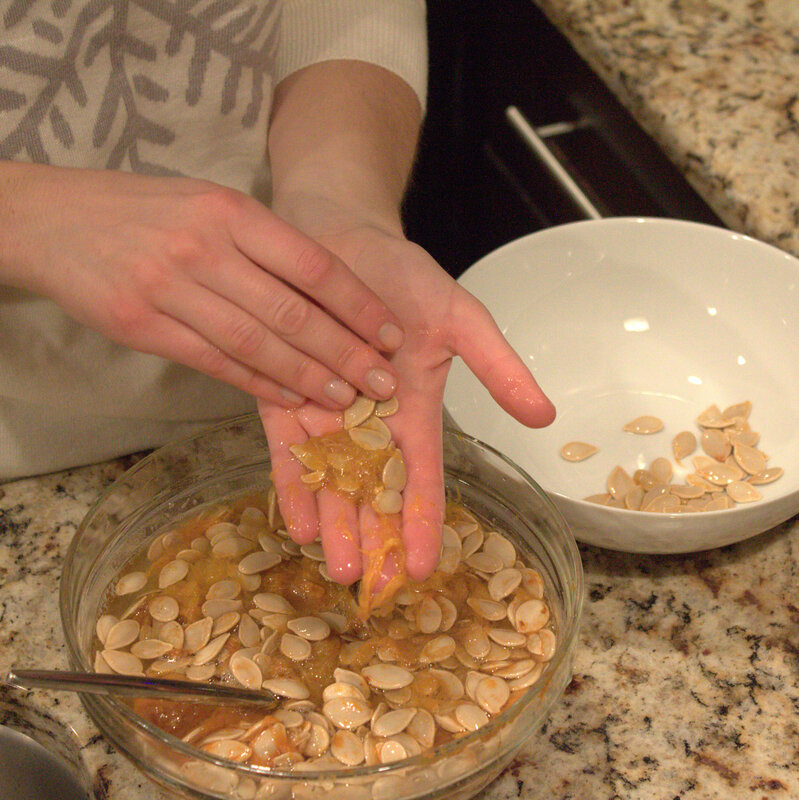 Once all your seeds are separated, give them a once-over to check for extra pieces of pulp. Then use paper towels to make sure they’re nearly as dry as you can get them. 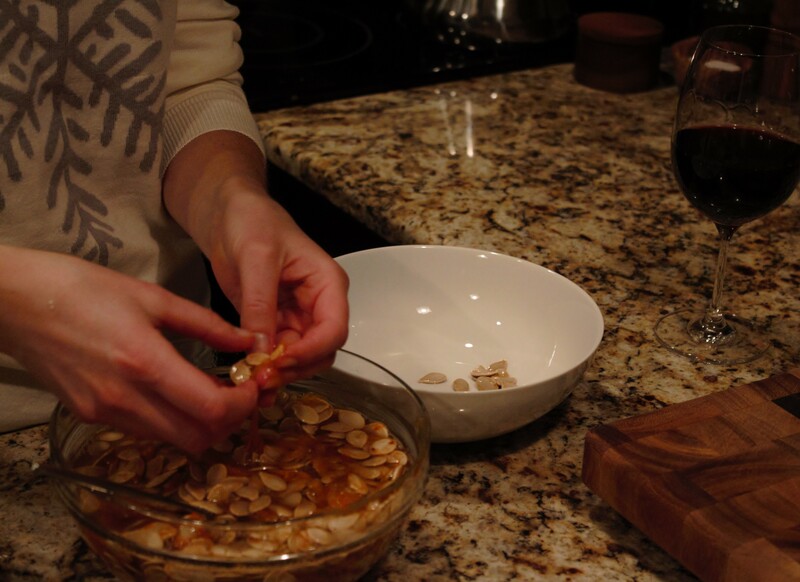 Damp seeds will take longer and struggle to get nice and crispy in the oven. Mix about 2 cups of the seeds with approximately 2 tbsp of olive oil (or melted butter), 1/2 tbsp of salt, 1/4 tsp of garlic powder, and 2 tsp Worcestershire sauce. Then bake them at 300 on a foil lined baking sheet for about an hour or until they start to turn a little brown. If you’re lucky enough to have some pumpkin seeds on hand today, do please enjoy yours – I have long since scarfed all of mine down. ← Did someone say Pumpkin Hand Pies? My appetite took a hit when you started off with talk of puke. But that was soon forgotten and I can’t wait to try this one out. Worcestershire sauce always reminds me of chex mix and that’s a good thing. You’re right – why aren’t we finding more opportunities to use Worcestershire sauce? ?